SBX-101 features a separate speaker bar and subwoofer: the speaker bar is designed to produce high and mid frequencies, generally vocals,instrumental music and environmental sound, whereas subwoofer adds a very specific and valuable quality to your home theater sound experience - you can feel the sound. The low frequencies produced by a subwoofer are typically made by musical instruments like bass drums,pipe organs, string bass and bass guitar, and movie sound effects like the rumble of a rocket launch. Compared to the flat and muffled sound from the average TV, SBX-101 brings a tremendous upgrade to the sound quality. With the 108 W maximum power, the output of SBX-101 is more than enough for most small houses. While new flat-panel TVs are designed with a thinner bezel, there is less space for the built-in speakers. 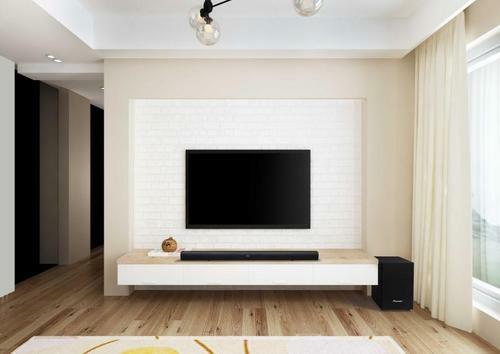 Given the less amount of space underneath the TV, positioning the speaker bar can be more difficult.The height of the SBX-101 is only 60 mm and it can be placed in front of most TVs without blocking the screen or even the subtitles. Nor will its smaller footprint affect the overall appearance of the TV either. 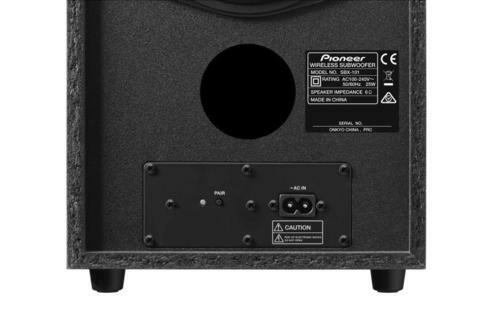 To provide deeper bass, the SBX-101 features a separate speaker bar and wireless subwoofer but the installation and setup are quite easy.After plugging in the AC cables,press the pairing button on the subwoofer to establish a wireless connection between the two units, and then the subwoofer will connect automatically the next time when speaker bar gets powered on. The SBX-101 provides AUX-IN, 3.5 mm Line-in and Optical inputs. Users can select an appropriate interface for their TV connection, and then the entire installation process is complete. Dolby Audio™ technology from Dolby Laboratories is designed to restore digital movie audio at home to the audio quality close to that of commercial cinemas. 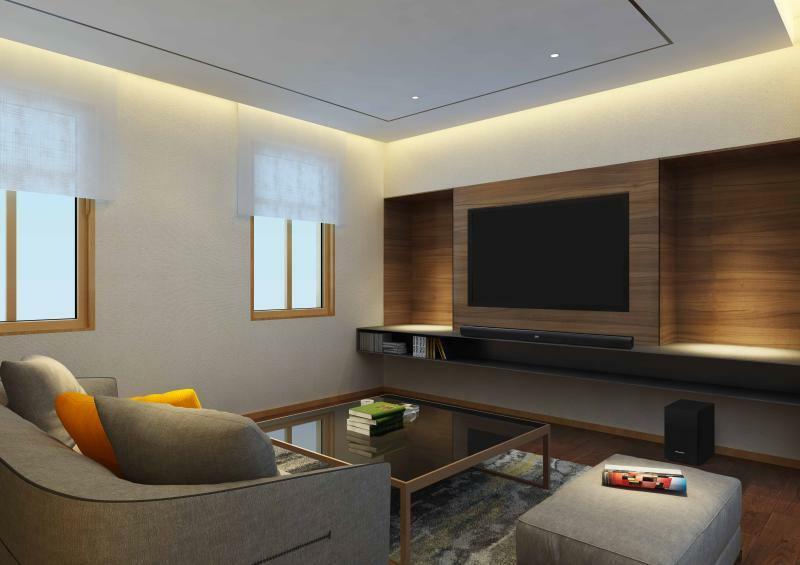 This allows users to stay at home while at the same time enjoying the harmonious and powerful sounds of movies and TV shows where both the audio and visual elements can be more fully experienced. Dolby Audio™ technology also allows 5.1-channel surround sound to be immediately remixed and converted to sound output suitable for a speaker bar configuration. Under the SBX-101 speaker grille, there is a set of hidden LED indicators, by which users can easily understand the current operating status of the speaker bar and see clearly if the operation commands are received. 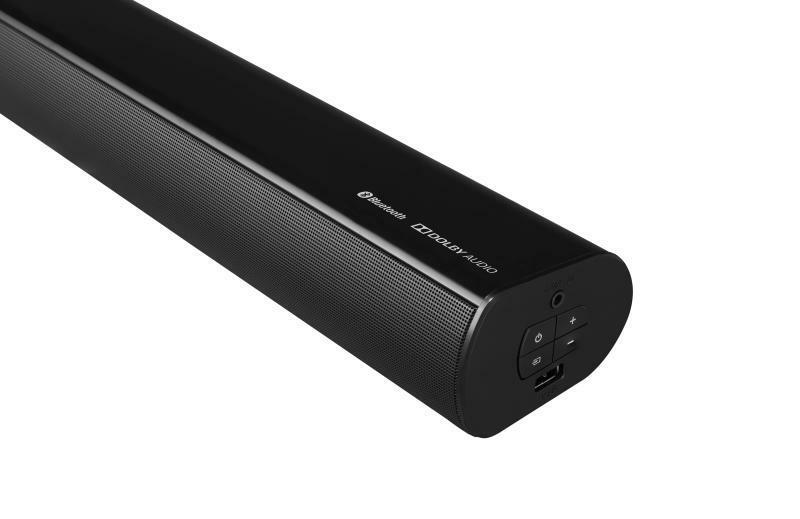 Users will no longer need to point the remote control at the speaker bar aimlessly without getting any visual feedback.